One of the things about Raspbian that has always been a bit unhelpful is that when a new user first boots up a new Pi, they see a nice desktop picture, but they might not have much of an idea what they ought to do next. 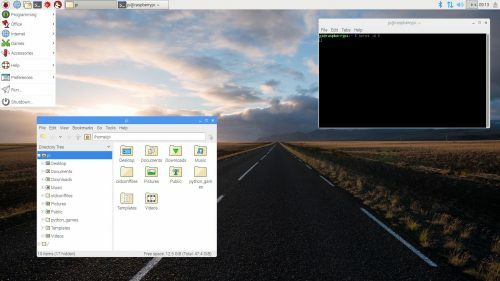 With the new update, whenever a new Raspbian image is booted for the first time, a simple setup wizard runs automatically to walk you through the basic setup operations. 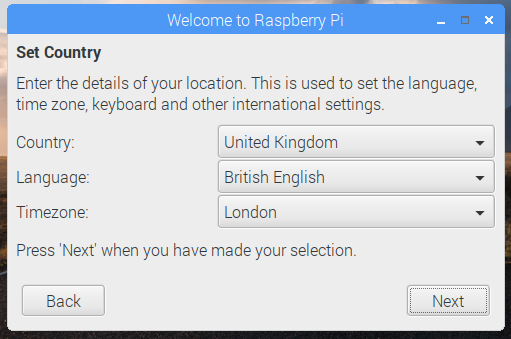 The localisation settings you can access via the main Raspberry Pi Configuration application are fairly complex and involve making separate settings for location, keyboard, time zone, and WiFi country. The first page of the wizard should make this a little more straightforward — once you choose your country, the wizard will show you the languages and time zones used in that country. Once you’ve chosen yours, the wizard should take care of all the necessary international settings. 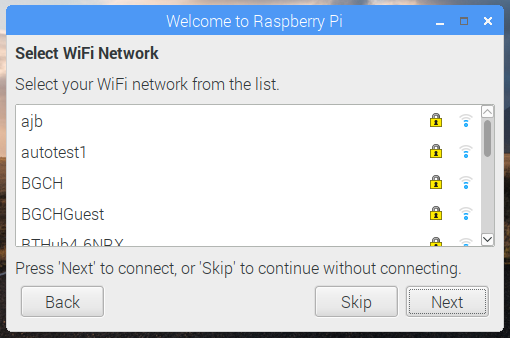 This includes the WiFi country, which you need to set before you can use the wireless connectivity on a Raspberry Pi 3B+. 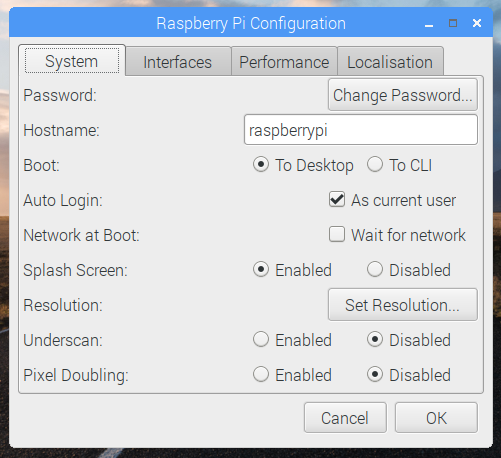 The next pages in the wizard will walk you through changing your password, connecting to the internet, and performing an initial software update to make sure you get any patches and fixes that may have been released since your Raspbian image was created. 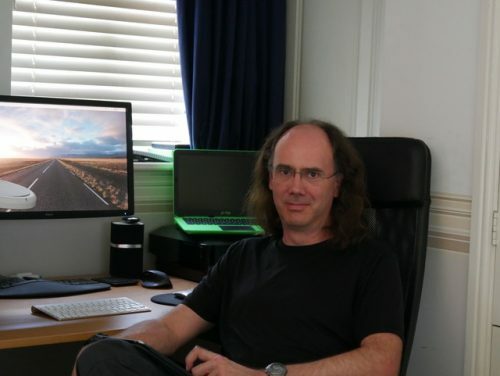 Over the last few years, several third-party companies have generously offered to provide software for Pi users, in some cases giving free licenses for software that normally requires a license fee. We’ve always included these applications in our standard image, as people might never find out about them otherwise, but the applications perhaps aren’t all of interest to every user. 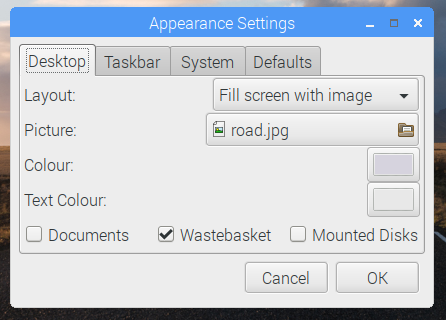 So to try and keep the size of the image down, and to avoid cluttering the menus with applications that not everyone wants, we’ve introduced a Recommended Software program which you can find in the Preferences menu. 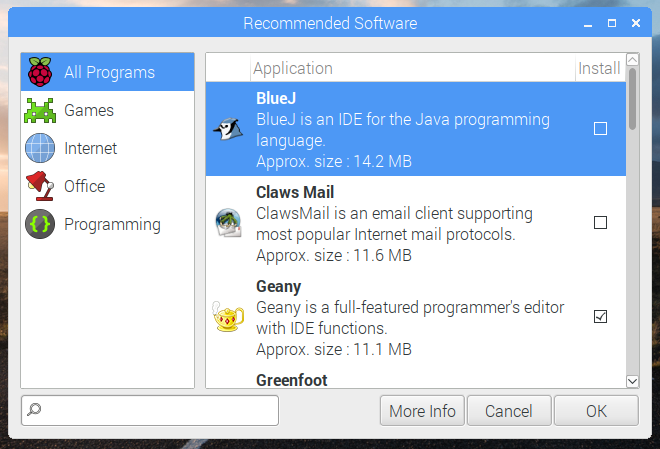 As we find new software that we recommend, or as more manufacturers offer us programs, we’ll add them to Recommended Software, so it’ll be kept up to date. 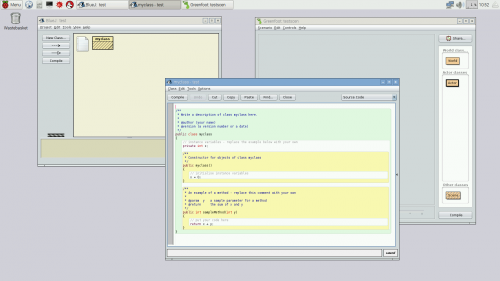 Ever since the first version, Raspbian has included the venerable PDF viewer Xpdf. 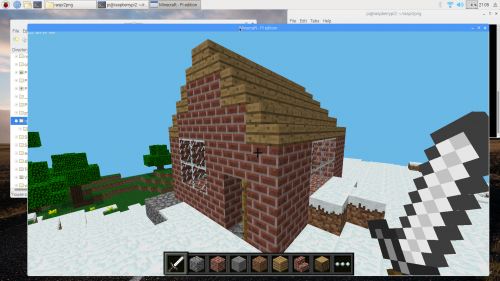 While this program does work, it’s fairly old and clunky, and we’ve been trying to find something better. In this release, we are replacing Xpdf with a program called qpdfView, which is a much-improved PDF viewer. It has a more modern user interface, it renders pages faster, and it preloads and caches future pages while you’re reading, which should mean fewer pauses spent waiting for the next page to load. 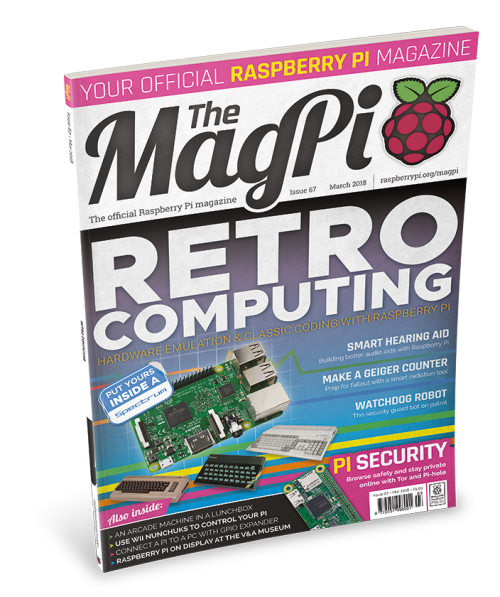 If you want something to read in it, we are now including the latest issue of The MagPi as a PDF file — look in the ‘MagPi’ directory in your home directory ‘pi’. The Chromium browser is now at version 65. We’ve also updated the links to our website in the Help menu, and added a new Getting Started option. 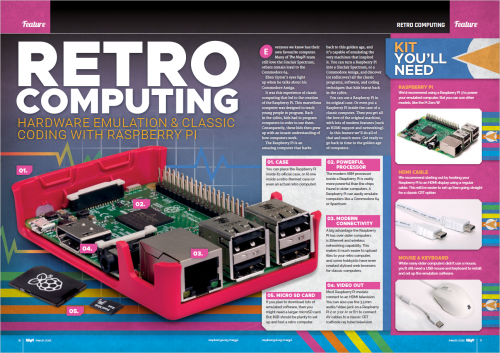 This links to some really helpful new pages that walk you through getting your Pi up and running and using some of its key features. 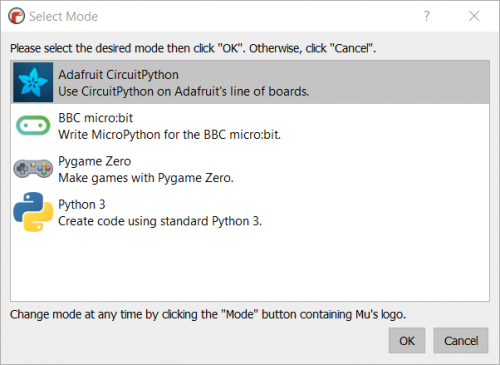 If you have volume up/down buttons on your keyboard, these will now control whatever audio output device is selected, rather than only controlling the internal audio hardware. The resolution has also been increased: each button push increases or decreases the volume by 5% rather than 10%. If you are using the network icon to reconnect to a wireless network, the passcode for the network will be shown in the connection dialog, so you won’t have to type it in again. 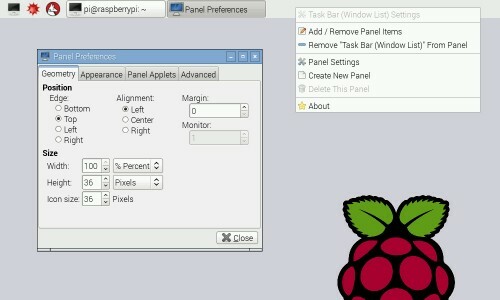 In Raspberry Pi Configuration, you can now enable and disable the serial port console independently of the serial port hardware. 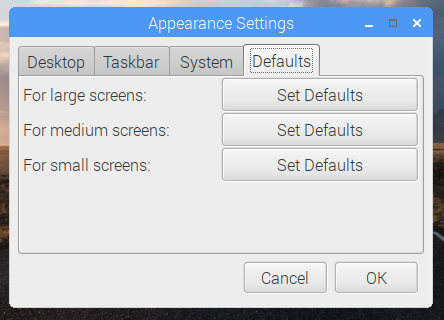 The keyboard layout setting dialogue now makes settings that should be correct both in the desktop and also when the Pi is booted to console. The new image is available for download from the usual place: our Downloads page. We’ve also updated the x86 image with most of the changes, and that’s up on the page as well. 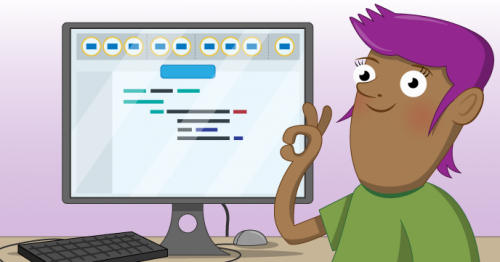 We hope you like the changes — as ever, all feedback is welcome, so please leave a comment below! 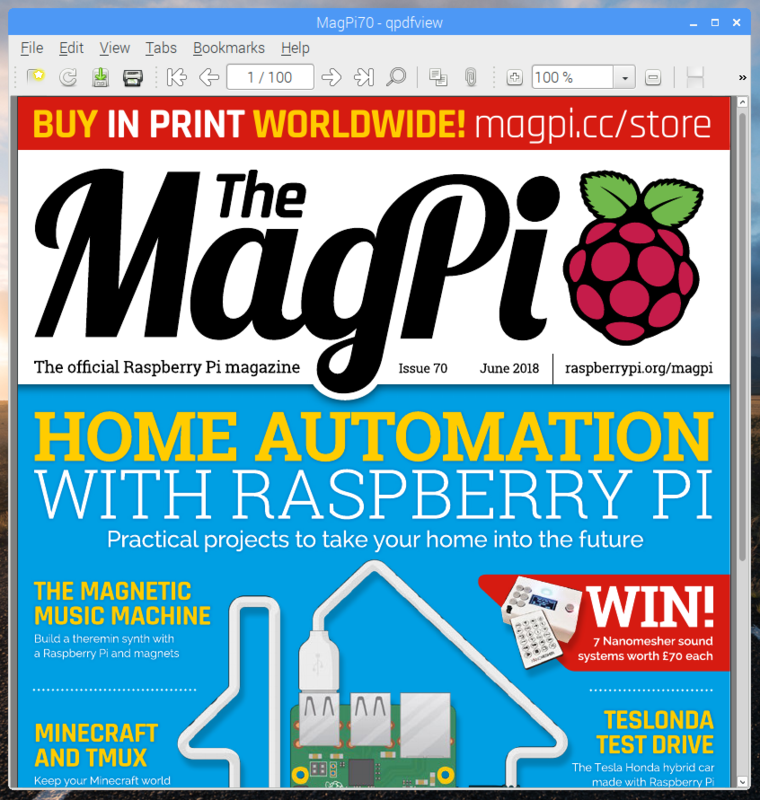 The post Raspbian update: first-boot setup wizard and more appeared first on Raspberry Pi. 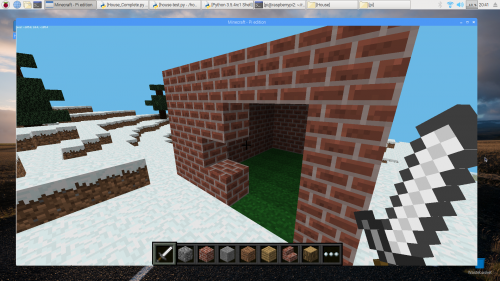 This entry was posted on June 29, 2018 by Simon Long. 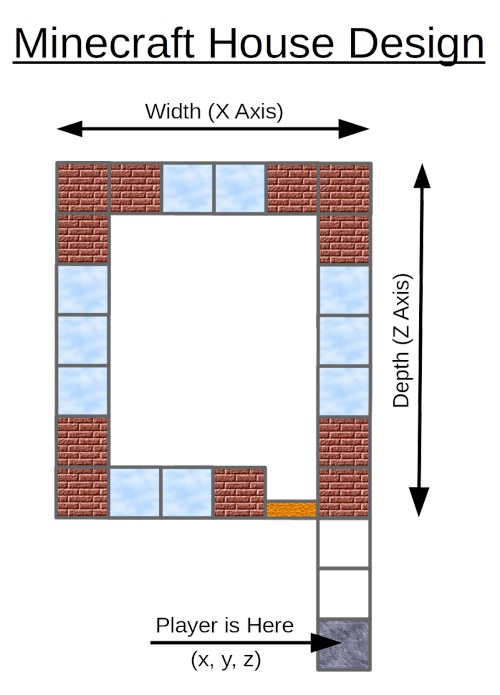 This entry was posted on April 12, 2018 by Rob Zwetsloot. 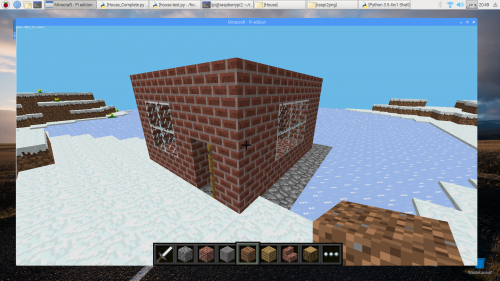 This entry was posted on March 15, 2018 by Simon Long. 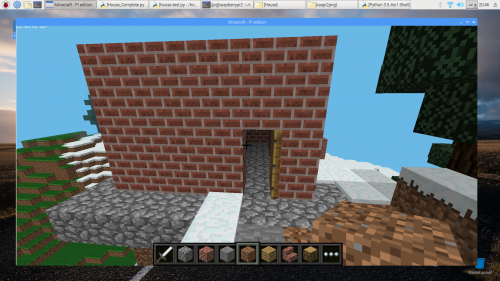 This entry was posted on February 22, 2018 by Rob Zwetsloot.